Welcome to Cooking With Cricut and our Thursday Cartridge Showcase. Today Chef Jenny R. has hijacked the blog and is taking us north, across the border, to her home turf of Canada! Jenny is showcasing the Cricut Go Canada! cartridge. This delightful cartridge is filled with Canada themed images and phrases. The whimsical font and French phrases are perfect for your cards, scrapbook layouts, home décor, and other creative projects. It includes six creative features: Layer, Phrase, French Phrase, Font, Font Shadow, and Monogram. So, without further ado . . . here's Chef Jenny R.! I was so excited when I saw that Cricut was coming out with this cartridge. As soon as it was released back in October, the hunt was on....this was a must have! Yes......I am Canadian Eh! Today I am going to try and do my best to showcase this amazing cartridge called “Go Canada!" 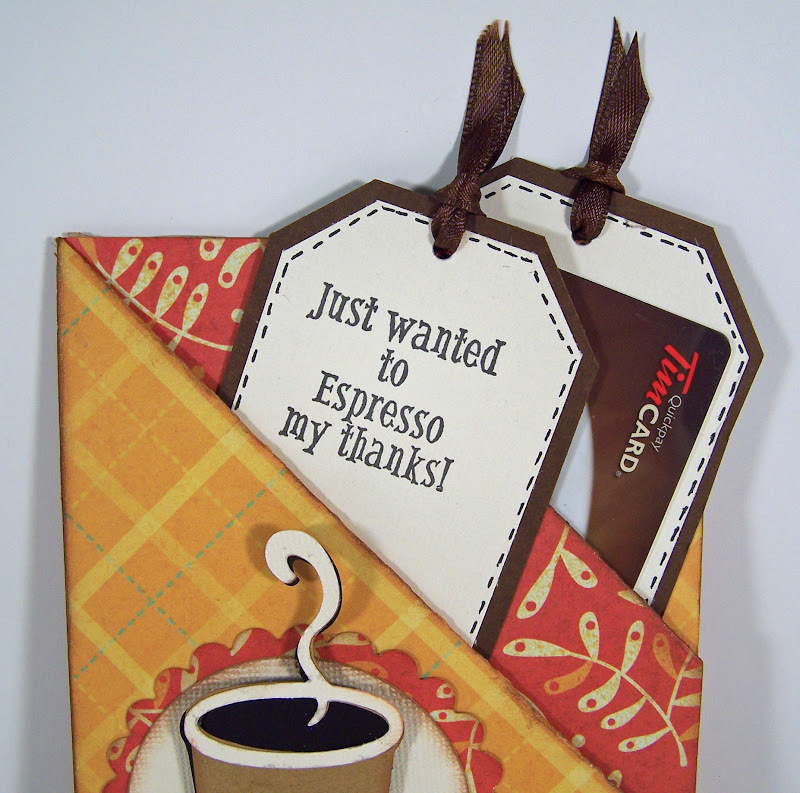 The first project is a Diagonal Double Pocket card which you can find the instruction for at Splitcoast Stampers. 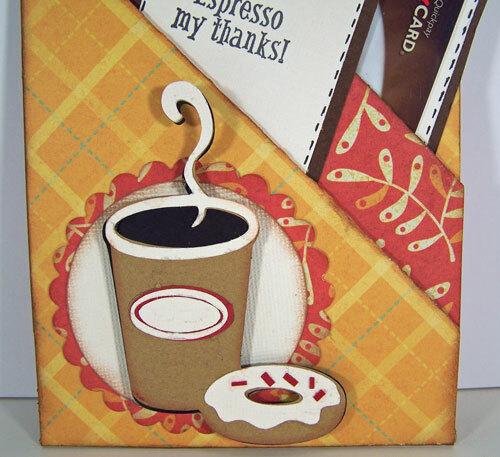 As soon as I saw the coffee and donut cut it reminded me of our famous Tim Horton's Coffee Shop which you can find all over Canada serving the best coffee and donuts and delicious little timbits, so I added a gift card to my project since everyone love Timmy’s!!! The second project is a gift box which I added maple cookies to. 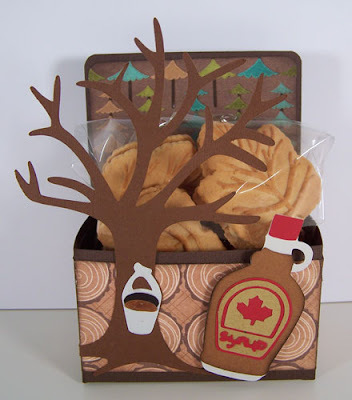 Again instruction can be found at Splitcoast Stampers for the box, I used both the maple tree and syrup cuts of this cartridge. Canada is well known for its maple syrup....... Once you taste the real Canadian Maple Syrup, you will be hooked for life! Next I have a 12X12 layout using a few more of the great cuts from this cartridge. 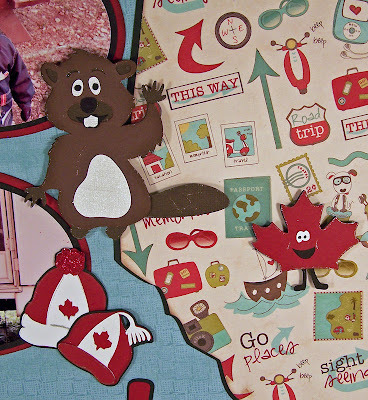 I have used the Canadian flag to make it into a hidden journal tag with my Gypsy. This is my nephew’s son waving the Canadian flag in front of Canada House in Banff, Alberta on Canada Day 2007. Canada is known for its vast forests and mountain ranges and the animals that reside within them, such as moose, beaver, grizzly, geese and the common Loon. 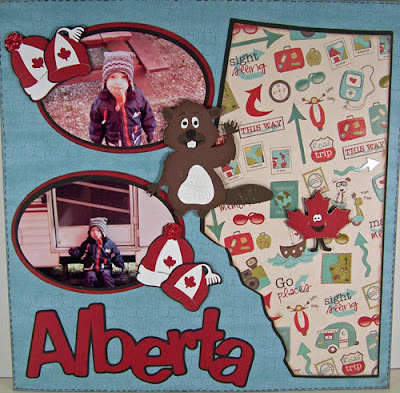 Last is another 12X12 layout, this time showing the province where I live, which is Alberta along with our Canadian Beaver which is our National Animal Symbol, toques and again my nephew’s son enjoying some real fine Canadian bacon. Provo Craft did a wonderful job designing this cartridge . . . I just love it-- it is one that every Canadian should own! Jenny you did a wonderful job showcasing this cartridge and your country!! 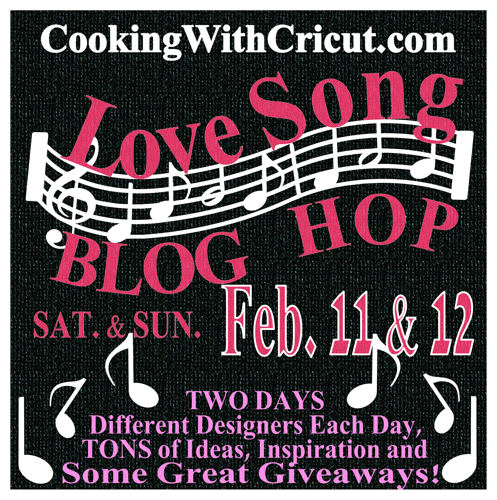 Make sure you head over to Jenny's blog and leave her some love! We hope you'll join us this weekend for two days of fun with two sets of designers for the . . .
We're also have a Design Team Call going on -- this Sunday, February 12 is the deadline to apply. For more information on becoming a part of this amazing team of talented crafters click here. We'd love to have you join us! I've had the pleasure of visiting parts of Canada: Niagara Falls (both US & Candian side), Vancouver & Toronto. These are MARVELOUS! Great job on ALL your projects. I also like your lay out and how you cut that cute travel paper and inked the edges!! 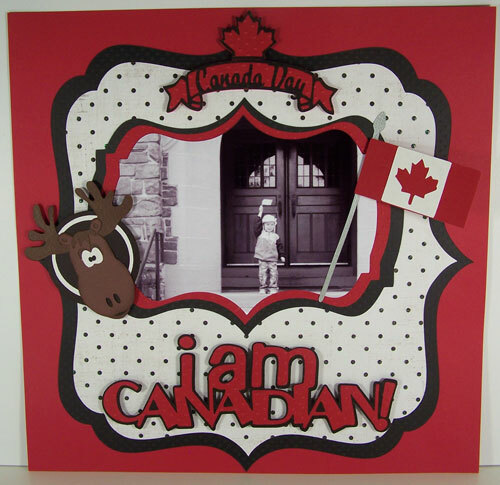 I love your showcase of Go Canada. I just wish it worked with the Ds Program PC tells me they are working on it. well newer carts are on it so why not this one.